Posted by @jennyjenjen in Christmas Break, Helpful Hints, Transportation, Travel. 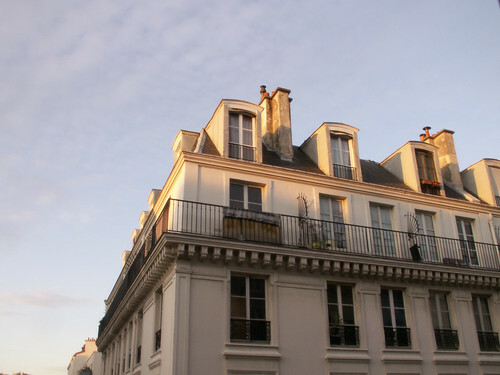 After a good night’s sleep, we spent the next day figuring out what we would do the rest of the week in the apartment on Rue du Chemin Vert. We also spent a few hours walking around the outskirts of Paris for a quick appointment. I had the address and spent the a little time the night before figuring out which stop we needed to take on le Métro. I’ve got to say that one of my favorite things about Paris is le Métro. One of the infamous signs for the metro. The Parisian underground is definitely the best way to travel in Paris. It’s quite nice to go on foot most places, but impossible to get across more than one quarter in a timely manner. It’s definitely worth figuring out which metro plan is best for you when you visit; should you get separate tickets, or perhaps a pass? When we first came to Paris, we bought the Paris Visite card for one day. This time, we bought the five-day tickets. Since my parents and brother arrived before I did, they had already bought one day; but my father went and bought me one the day after I arrived. It was a great deal and we didn’t have to use any other mode of transport getting around the city. I’m not sure if it’s true, but I have read that if you are within the Paris city limits then you are never more than 1,000 meters away from a metro stop at any given time. Posted by @jennyjenjen in Christmas Break, Transportation, Travel. So, as previously noted, I took a flight from Skavsta Airport to Beauvais airport just outside of Paris. I left at 5:10 in the morning to make it to the airport a few hours before my noon departure, just as instructed for all passengers so that everything can be ironed out without risking missing a flight. I arrived at Beauvais just a little after schedule, and my father’s friend Bertrand was waiting for me. Bertrand and his wonderful family live only 20 km from Beauvais, and he does his flight training there. 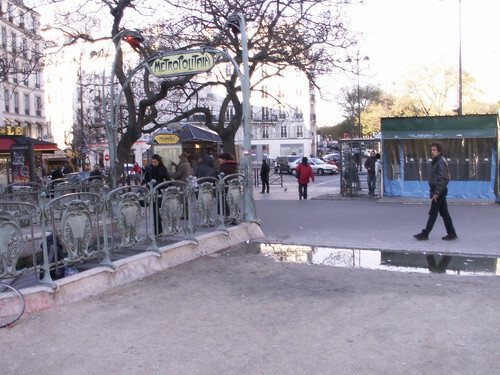 He offered to take me to a train station from where I would take the RER into Paris and Le Métro to the apartment we were renting in the 20th quarter (20e arrondissement) of Paris. I used Bertrand’s phone to briefly call my parents at the apartment; they had already arrived in Paris. The ride over to the train station was a little bumpy; I get rather motion-sick, and it had been months since I’d ridden in a car for any longer than ten minutes. It didn’t help that the flight had some interesting turbulence and a bumpy landing. Nor did I get much sleep the night before. I felt a little better with some orange juice and a snack at the train station. We tried calling my parents again, but nobody answered. We assumed everyone was probably sleeping, but since the stop was so close to their house and I had their address, I figured it would not be too difficult to just find my way over there. One of the great things about my plan to spend the year here in Sweden was that my family planned on meeting me in France to spend the holidays. Upon first consideration, it was a good idea considering I would be able to share some of my travels with my family. It would also make the entire year a little easier for me; I would see my family and have an escape from Sweden for a little while, but I would not suffer some extra detachment from home upon return from Colorado had I decided to just go home for the holidays. Sometime in the fall, I booked my flights with RyanAir. Though it’s possible to get flights with RyanAir for only a few cents plus $25 or so in fees, I took a flight that cost roughly 1,000 SEK or about $130. That included my one-bag allowance for checked items. I’d heard a lot about RyanAir in terms of it being somewhat of a flying cattle car. It was my first experience with RyanAir, so I wasn’t necessarily looking forward to the flight. It turned out that, yes, it felt a bit stuffy and crowded in the plane, but the flight experience itself was not too terrible. There was one pretty dreadful landing, but everyone was safe so no harm done. There were no free refreshments, but what usually comes free on a plane (chips, soda) were not terribly expensive. Posted by @jennyjenjen in American Holidays, Transportation, Weather. It’s kind of a Colorado thing. Ya know, that Halloween brings the first snow. 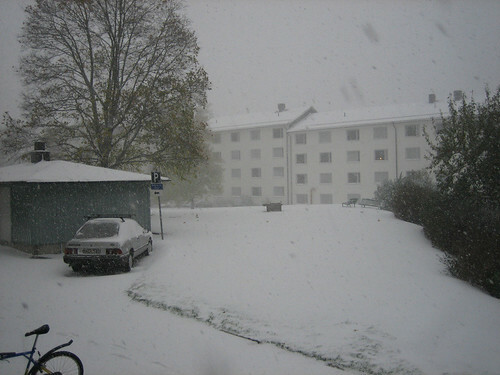 But in Uppsala this year, Halloween also signaled the first snow, and a heck of a blizzard it was. The snow really didn’t build up until the day after, but the flakes were flying and it was feelin’ a little chilly out. It was madness once the snow came. Busses were sliding all over the place and were constantly running late. Of course, nobody wanted to ride their bicycles nor did walking sound very appealing. The snow was blowing horizontally and visibility was ridiculously low. There were a lot of sirens that first day of snow! Unfortunately, I didn’t take my own pictures of the first snow. I’m disappointed in myself because I’ve always enjoyed the first snow. I usually get tired of snow after a while (especially when there’s nothing you can do with it, that is, for example, we don’t have mountains here! 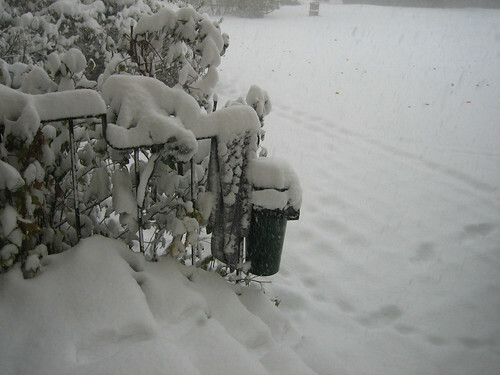 ), but the first snow is always amazing. You know you want to live in Sweden! It isn’t snowing right now and it hasn’t snowed significantly since, but it might soon. It’s been unseasonably warm (it’s 4° C at the moment), so I’m not sure when the rain will stop and the snow will begin – for real. Posted by @jennyjenjen in Helpful Hints, Language, Swedish Lessons, Transportation. On my second day here, a German exchange student named Kerstin arrived. The next day we were sitting watching television when we decided to go look for a bicycle; Uppsala is a pretty pedestrian-friendly city, and a bicycle is a must-have for any student (or really, anyone at all) in Uppsala. It was a Saturday, and there would be flea markets and the shops would still be open, so we ventured to town on the bus and got off in the city center. After picking up some newspapers at Pressbyrån and then finding a place to get some coffee, we sat down and looked through newspaper advertisements for anything about used bicycles. We found a neat place called Saluhallen, which I’ve visited quite a few times since my arrival. It isn’t the cheapest place in the world, but it’s not bad, either. We called one man who we later figured out lived way too far north for it to be anything less than a hassle to visit, but that was all that was good in the newspaper advertisements. We were beginning to get a little frustrated when we picked up a free newspaper that was sitting at the table, Uppsala Tidningen (which turns out not to be that bad of a newspaper; it reminds me of the Colorado Daily, but better). It was then that we discovered two advertisements for damcyklar (women’s bicycles) and herrcyklar (men’s bicycles), both with the same number; so, we figured we’d check it out. Posted by @jennyjenjen in Helpful Hints, Language, Transportation, Travel. After three flights and more than a day and a half without sleep, I arrived at Arlanda Airport just north of Stockholm at about 2:00 pm. I had no problems with getting my luggage, although to fly from Manchester to Arlanda I had to check my carry-on that I had with me from Denver to Chicago and Chicago to Manchester. My luggage came out near the beginning, so I was all ready to go right away. After freshening up in the restroom quickly, I headed out to catch the bus to Uppsala. I actually missed the first one that was there (and the driver wasn’t going to stop for me, oh well), but waiting an extra 15-20 minutes was no hassle after having traveled over 14 hours. Right off the bat, I was speaking plenty of Swedish. On the bus ride to Uppsala, I met one of the people who was coordinating the international student activities, a student who was an exchange student himself in the States. He told me how to get to the offices I needed to get to once I arrived, but it ended up being unnecessary as I needed to hail a taxi to help me with all the bags I had once I got there (later, I found that one of my friends coming to Uppsala had brought more than I had, and what I had was virtually nothing compared to his luggage!). After getting to the international office I quickly found out that it was closed. (Ugh! The hours discussed in the booklet were for the following week, and since I’d arrived early, didn’t apply to me.) I left my luggage with a receptionist next door and headed to the Studentstaden office to get my key. If I were to do it over again, I probably would have been better at reading my acceptance packet (there are so many different resources for telling one how to get along when you arrive, but the best instructions to follow are the ones that come in the acceptance packet!). 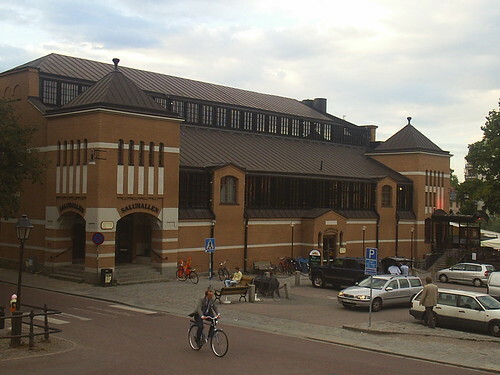 I should have left my luggage at Västgöta Nation while I went to Dragarbrunnsgatan 42 (the Studentstaden office) to get my key, then check into the international office.